Top 10 museums of Germany, from art and design to history and science. Museum Island (Museumsinsel) in Berlin's historic heart is home to five world-class museums; this unique ensemble of historic museum buildings, all built under different Prussian kings, is a UNESCO World Heritage site and covers everything from the famous bust of Egyptian Queen Nefertiti to European paintings from the 19th century. Museum Island is home to the Altes Museum, Alte Nationalgalerie, Bode Museum, Neues Museum, and Pergamon Museum, which is one of the most visited museums in Germany thanks to its monumental reconstructed temples and gates of the ancient world. The Zwinger Palace in Dresden, a sprawling complex of pavilions, galleries, royal gardens, and inner courtyards, built in the late Baroque period, is worth a visit for its architecture alone. But don’t miss the superb museums housed inside the palace: There is the Old Masters Gallery, which displays the famous Madonna Sistina of Rafael; the Dresden Porcelain Collection, the Armory with its ornamental collection of antique weapons, and the Royal Cabinet of Mathematical and Physical Instruments. Another must-see museum in Dresden is the Green Vault (Grünes Gewölbe), home to one of the finest royal treasures collections in Europe. Housed in the Dresden Palace, the treasure chamber was founded by August the Strong in the 18th century and is filled with elaborate artworks of gold, silver, gems, enamel, ivory, bronze, and amber. A highlight if the collection is the largest green diamond in the world. Get your tickets well in advance. Munich is home to a unique ensemble of three museums, each of them highlighting a different period of art history: Alte Pinakothek is one of the oldest art galleries in the world and houses over 800 European masterpieces from the Middle Ages to the end of the Rococo; it is home to one of the world's biggest Rubens collections. Neue Pinakothek next door is dedicated to art and sculpture from the late 18th to the beginning of the 20th century. Highlights include German art of the 19th century, such as paintings from Caspar David Friedrich, and a wonderful collection of French impressionists. Pinakothek der Moderne is the largest museum for modern art in Germany and spotlights art of the 20th century. The vast gallery complex unites four collections under one roof: The State Graphic Collection; the State Museum for Applied Arts; the Museum of Architecture of the Technical University of Munich, the largest specialist collection of its kind in Germany; and the State Gallery of Modern Art showcasing big names such as Picasso, Magritte, Kandinsky, Francis Bacon, and Warhol. The Deutsches Museum (German Museum) is proud to be one of the oldest and largest science and technology museums in the world. It boasts a fascinating collection of historic artifacts, from the first electric dynamo, and the first automobile, to the laboratory bench where the atom was first split. Other highlights of the museum include exhibitions on astronomy, transportation, mining, printing, and photography. The Jewish Museum Berlin chronicles Jewish history and culture in Germany from the Middle Ages to present-day. The sprawling exhibition is informative and well organized - but it is mostly the spectacular building designed by Daniel Libeskind, which leaves a lasting impression on its visitors. The striking architecture is defined by a bold zigzag design, underground tunnels connecting the three wings, irregularly shaped windows, and ‘voids’, empty spaces stretching the full height of the building. One of Cologne’s oldest museums, the Wallraf-Richartz Museum, houses 700 years of European art, from paintings of the medieval period, and Baroque, to German Romantics and French Realism. One of the many highlights is the museum's wonderful collection of impressionist art, the largest of its kind in Germany. Berlin's Bauhaus Archiv is home to the world’s largest Bauhaus collection, offering an in-depth introduction to the German avantgarde school and its impact on design, art, and architecture around the world. The museum has its home in a building designed by Walter Gropius, founder of the Bauhaus school, and shows a fascinating collection crafted by Bauhaus teachers and students, from ceramics, furniture, and sculpture, to weaving, printing, and bookbinding. 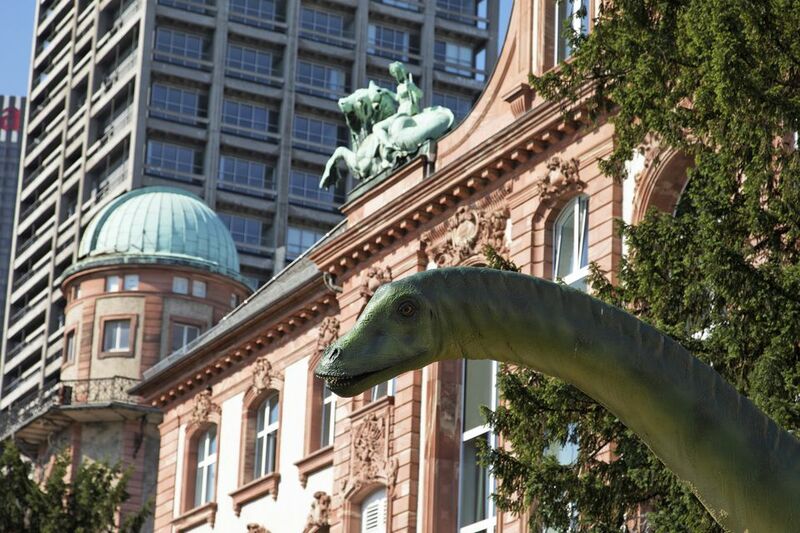 The Senckenberg Museum in Frankfurt is one of largest museums dedicated to natural history in Germany. The museum showcases more than 400,000 exhibits, ranging from fossil amphibians, and American mammoths, to Egyptian mummies. Highlight of the museum is its presentation of large dinosaur skeletons (including a Tyrannosaurus Rex), one of Europe’s most diverse exhibitions. Hamburg is home to a trio of architectural gems that house one of the most impressive art collections in northern Germany. Over 700 years of European art history are represented at the Hamburger Kunsthalle, from medieval altars to modern paintings by German artists Gerhard Richter and Neo Rauch. Highlights of the museum include Dutch masterpieces from the 17th century by Rembrandt, art from the Romantic Period in Germany by Caspar David Friedrich, as well as an excellent collection of the painters of the Bruecke art group.